Carlton is one of the oldest and most decorated sporting clubs in Australia. Can Carlton recreate glory years? Carlton is one of the oldest and most revered sporting clubs in Australia. 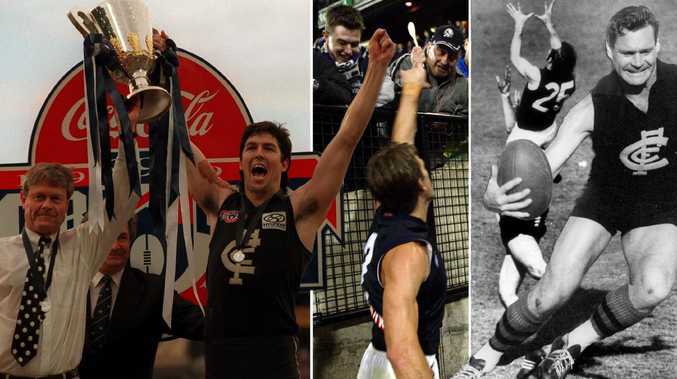 While their supporters have been singing the Blues since the team's last premiership in 1995, the longest drought in the club's 154-year history, Carlton remains one of the "big four" traditional teams in the AFL, with a large following and a proud history. Carlton Football Club was established in July 1864 as an offshoot of the Carlton Cricket Club, which had launched three years earlier. The club has always worn navy blue with pride, but at first it was an expedient decision. Older dyeing methods had a habit of stripping away wool's natural water-resistant qualities, but blue dyes of the day still allowed the wool to repel water. Many working people, especially outdoor workers, owned dark blue jumpers. In the winter months, they'd wear their dark blue working clobber to stay warm and dry while playing footy, and a tradition was born. 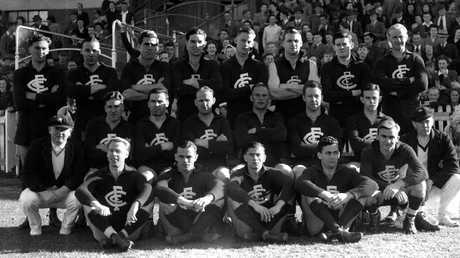 The Carlton Football Club that won the 1945 “Bloodbath” Grand Final at Princes Park. Carlton was a founding member of the Victorian Football Association in 1877 and won its inaugural premiership that year, but it was already a heavyweight in pre-VFA competition, winning flags in 1872, 1873, 1874 and 1875. But the Blues entered the doldrums for many years after that early flush of success, with only one more premiership, in 1887. But its lowly status was overlooked when it was invited to join the rebel Victorian Football League for its first season in 1897. By then, at least, it had secured an enclosed ground and the rights to charge admission thanks to an agreement with the Carlton Cricket Club. Carlton spent its first five years in the VFL as cellar-dwellers before a fundamental change. Jack Worrall, the former Victorian and Australian champion cricketer who'd also played VFA football with Fitzroy, was persuaded to switch from the Fitzroy Cricket Club to Carlton's in the 1890s and in 1902 was appointed secretary of both the Carlton cricket and football clubs. He became the prototypical Aussie rules coach, a position that had not existed in the modern sense before Worrall. His highly intense coaching style and insistence that his charges train harder than any other team bred resentment from some players but he got results. 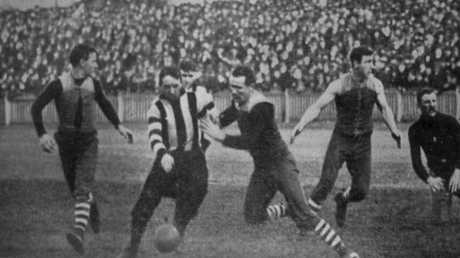 Carlton made the VFL finals in 1903, 1904 and 1905 and pulled off the first VFL hat trick in 1906, 1907 and 1908. Pressure from a group of players forced Worrall's resignation during the 1909 season, after 144 matches as coach. Carlton was runner-up in 1908 and 1909, and went back-to-back in 1914 and 1915. Worrall coached Essendon to two premierships in 1911 and 1912. Carlton did not get its hands on the VFL silverware again until 1938, led by champions including Bob Chitty, Harry "Soapy" Vallance and Jim Wrout, who booted four goals that day in front of a then record grand final crowd of more than 96,000. Carlton was one half of the most infamous grand final in VFL/AFL history, the 1945 "Bloodbath" clash with South Melbourne. With the MCG still unavailable because of its military use through World War II, the match was staged before 52,000 people at Princes Park. Carlton came from fourth on the ladder to make the grand final, and South Melbourne, known colloquially as the Bloods, was the firm favourite. 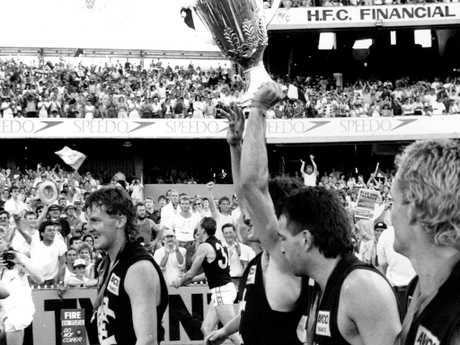 1987 Grand Final. Carlton v Hawthorn. MCG. Tom Alvin holds the premiership cup. Chitty, by then one of the league's most feared tough guys and captain of the Blues, belted Ron Clegg in the second quarter, sparking a series of violent incidents that involved players, officials, umpires and police. Carlton came out on top 13.15 (103) to 10.15 (75). Ten players were reported, and seven were rubbed out for a total of 69 matches. The Blues went on to win their eighth flag in 1947, defeating Essendon by a point, and the team was runner-up to Essendon in 1949 after a 73-point drubbing. 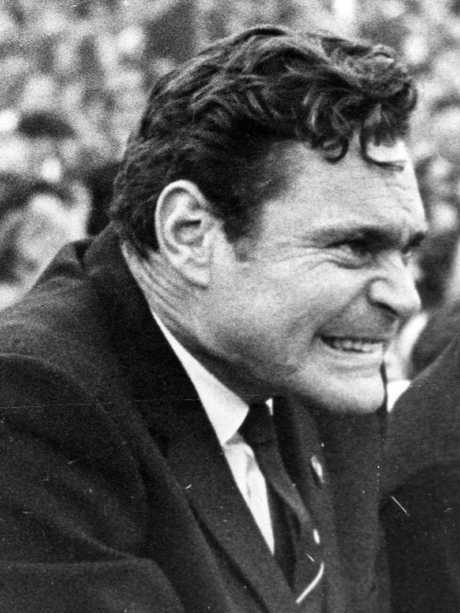 It would be 1962 before Carlton was back in the grand final, going down to Essendon once again, but the mood began to change at Princes Park with the recruiting coup of the century - Ron Barassi's controversial switch from Melbourne immediately after the Dees' last grand final win in 1964 to become Melbourne's captain-coach. 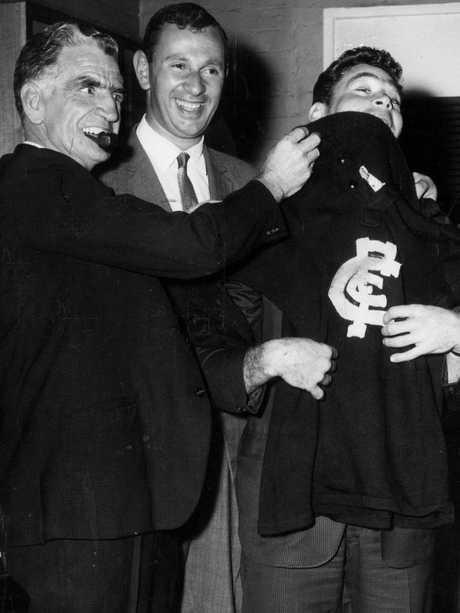 With Melbourne coach Norm Smith seemingly entrenched in the role, and Barassi keen to coach, Carlton made him a financially lucrative offer that horrified the football world, making him the Blues' captain-coach. Barassi coaching the Blues in their 1968 semi-final against Essendon. They secured two premierships in that dominant run. The Blues beat arch rivals Essendon by three points in 1968 - Barassi didn't play that day but coached - with Brian Kekovich (brother of Sam) starring with four goals and champions including Alex Jesaulenko, Wes Lofts, John Nicholls, Percy Jones, Ian Collins and Robert Walls. And under Barassi as coach, Carlton rolled old foes Collingwood in 1970 with a comeback from 44 points down at half time to win by 10 points, fired by an innovative rapid-fire use of handball that left the Magpies flat-footed. Little known rover Ted Hopkins led the charge with four goals after being subbed into the game at half time. He played only one more game in his 29-match career with the Blues, but cemented his place in history that day before a record crowd of 121,696. Barassi departed for Port Melbourne in the VFA in 1971. New captain-coach John Nicholls led the Blues to victory against Richmond in 1972, building a team that would outscore the powerful Tigers side that had beaten the Blues in the second semi-final replay by 41 points (the first was drawn). Carlton won 28.9 (177) to Richmond's 22.18 (150). Jesaulenko booted seven goals, with six each to Robert Walls and Big Nic in a team in which Syd Jackson, Bruce Doull, Geoff Southby and Percy Jones were among the stars. While competitive for most of the '70s, it was not until 1979 that Carlton won another flag, heralding another golden era for the club. 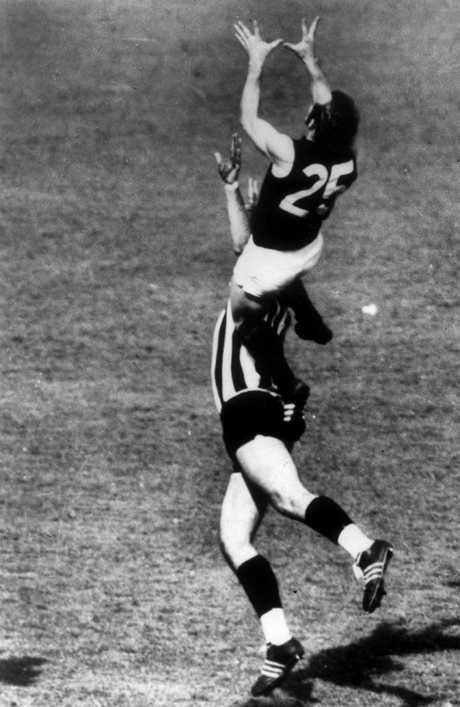 Alex Jesaulenko’s famous mark over Graham Jenkins in the 1970 Grand Final. The 1979 grand final win over Collingwood by five points was Jesaulenko's last with Carlton and was marked by Wayne Harmes' controversial tap from the boundary line to Kenny Sheldon in the goal square, ensuring Carlton got home for the win. The Blues delivered Collingwood three grand final losses in a row in 1981 with a thrilling come-from-behind win. Down by nine points and three quarter time, Carlton came home with a wet sail, kicking the last six goals and holding the Magpies to two behinds in the final quarter to record a 20-point win. Bruce Doull won the Norm Smith Medal. Goal-kickers included Rod Ashman (3), David McKay, Mark McClure, Ken Sheldon (all with two), Jimmy Buckley, Wayne Johnston and Wayne Harmes. The Blues backed up in 1982, beating Richmond by 18 points in a tight contest - a victory that gave it the most premiership wins, a title Carlton has held alone or shared with Essendon ever since. Stephen Kernahan, Craig Bradley and Norm Smith medallist David Rhys-Jones heralded a new era for the Blues in 1987 with a convincing 33-point victory over Hawthorn, but there was little success for Carlton in the years to follow. The premierships have not flowed so freely at Princes Park since the VFL competition went national. Carlton won its 16th flag in 1995 with a thumping 61-point win over Geelong after a season in which the Blues only dropped two matches led by Kernahan, Bradley, Steve Silvagni, Justin Madden, Anthony Koutoufides and Brett Ratten. 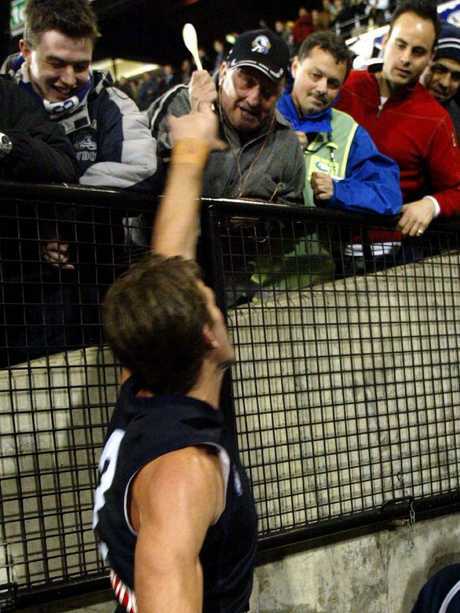 A Collingwood fan taunts Corey McKernan with a wooden spoon in 2002. Justin Murphy celebrates the 1999 preliminary final victory. 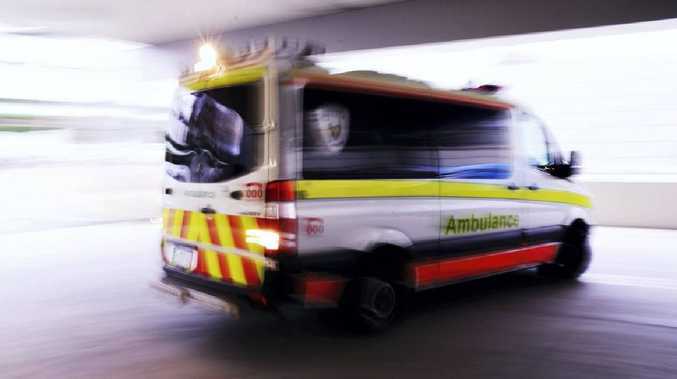 The Blues would go on to lose to North Melbourne. 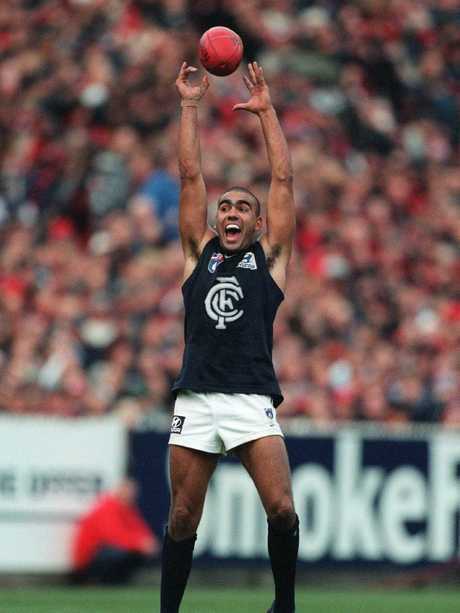 Carlton was competitive through the 1990s, featuring regularly in the finals and appearing in losing grand finals against Essendon's Baby Bombers in 1993 and North Melbourne in 1999. As its champions retired around the turn of the century, its performance waned quickly and the Blues won their first wooden spoon in 2002. That same year, massive salary cap breaches cost the club many draft picks and a $983,000 fine, the effects of which are still being felt at Princes Park. Longest serving captain: Stephen Kernahan (226 games as captain from 1987 to 1997). Brownlow medallists: Bert Deacon (1947), John James (1961), Gordon Collis (1964), Greg Williams (1994) and Chris Judd (2010). Barassi’s defection from Melbourne to Carlton stunned the footy world.